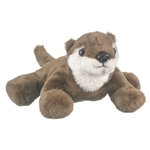 Our stuffed otters and plush otters are every bit as enjoyable as the real thing so if you're looking for a playmate then you've come to the perfect place. 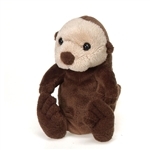 Every otter stuffed animal that we carry is capable of providing endless amounts of fun and happiness! Read more. If you want a plush otter but are worried about what it will eat then you should probably choose one of our plush otters that comes with its very own starfish. We have several stuffed otters that thought ahead and packed their own lunch! The one thing our otter stuffed animals love as much as playing is snuggling. Each plush otter we carry is made of soft, child-safe, high quality plush fabric and is ready to cuddle the moment it arrives at your home. Playing and cuddling are the only things these stuffed otters want to do it seems. They're a lot like our staff in that way. Now, put your play clothes on and choose your very own stuffed otter from our great selection and be ready to have a blast as soon as it arrives. Shop.